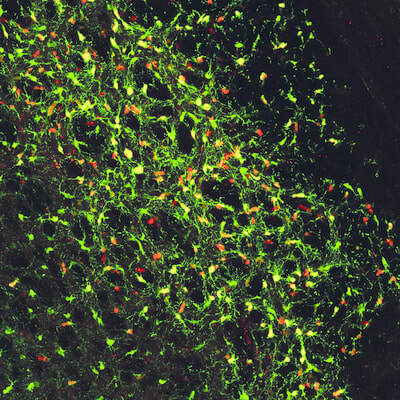 Neural stem cells give rise to the amazing cellular and functional diversity of the central nervous system, and certain types persist into adulthood in discrete regions within the brain. 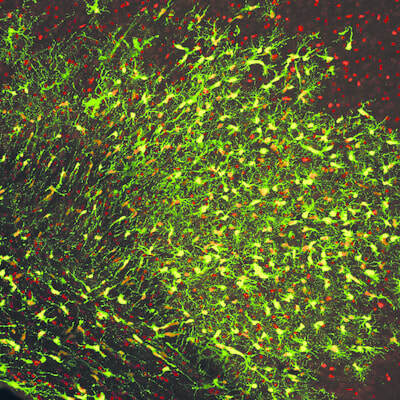 These stem cells periodically exit self-renewal, commit to specific lineages and differentiate into mature neurons, astrocytes or oligodendrocytes. A highly ordered, stereotyped process coordinated by transcription factor binding and chromatin remodelling underpins these cell state transitions, enabling the silencing and activation of different sets of genes. 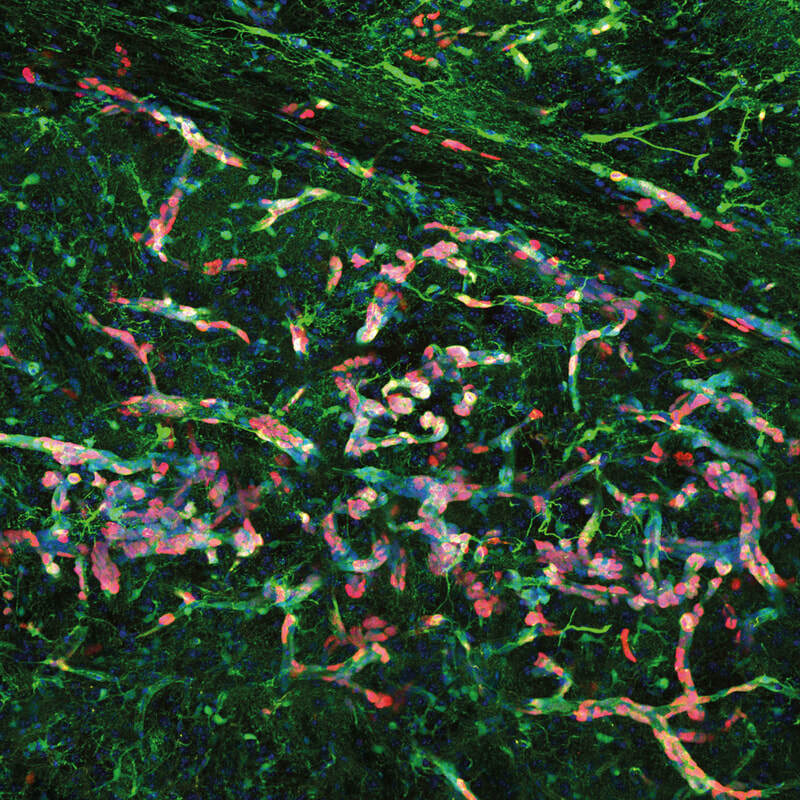 Moreover, these stem and progenitor cells are not homogeneous— they vary in space and time, and certain regions and developmental epochs are more prone to tumourigenesis than others. This may be why brain tumours in adults vs children correlate with different brain regions and mutations, suggesting that they may arise from different types of cells entirely. Sadly, brain tumours are the most common solid malignancy in children and the leading cause of cancer-related death in this age group. 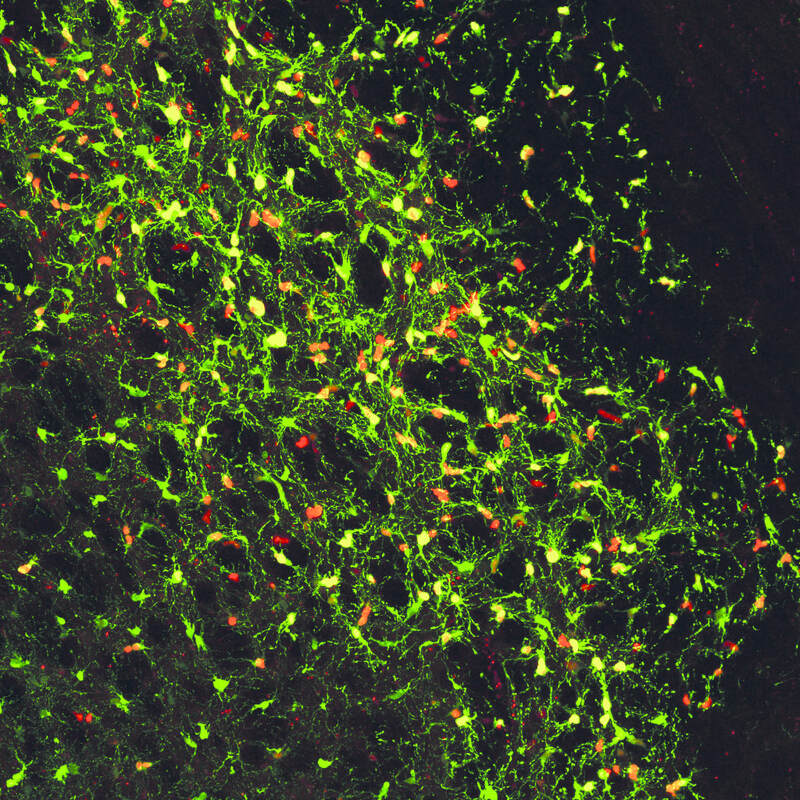 In the stepwise, unidirectional process of neural stem cell self-renewal, fate commitment and differentiation. 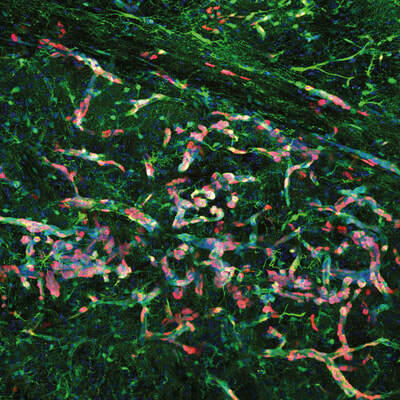 During the emergence and in the maintenance of aberrant neurodevelopmental programmes that sustain paediatric brain tumour cells. In the plasticity required for the development of resistance to chemoradiotherapy that allows tumours to evade treatment and recur. Chromatin remodelling is a dynamic, ongoing process that allows changes in gene expression to persist through cell divisions and over time. This is how one fertilised egg can give rise to a multiplicity of specialised cell types during development. Chromatin is also the substrate upon which barriers between different cell fates are built and maintained, i.e. 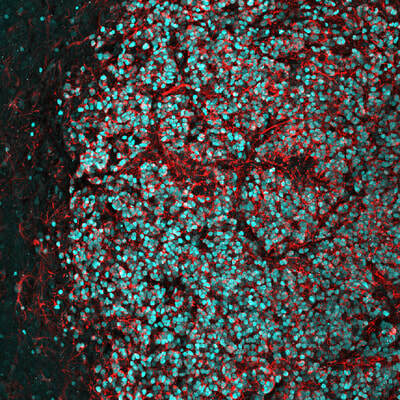 how neurons remain neurons and liver cells remain liver cells. These "epigenetic" barriers can become destabilised in cancer, and are dismantled by design during somatic cell reprogramming to generate induced pluripotent stem cells. Therefore, chromatin remodelling is integral to gene expression dynamics, allowing either the stable maintenance of a particular cell state or the transition from one cell state to another. 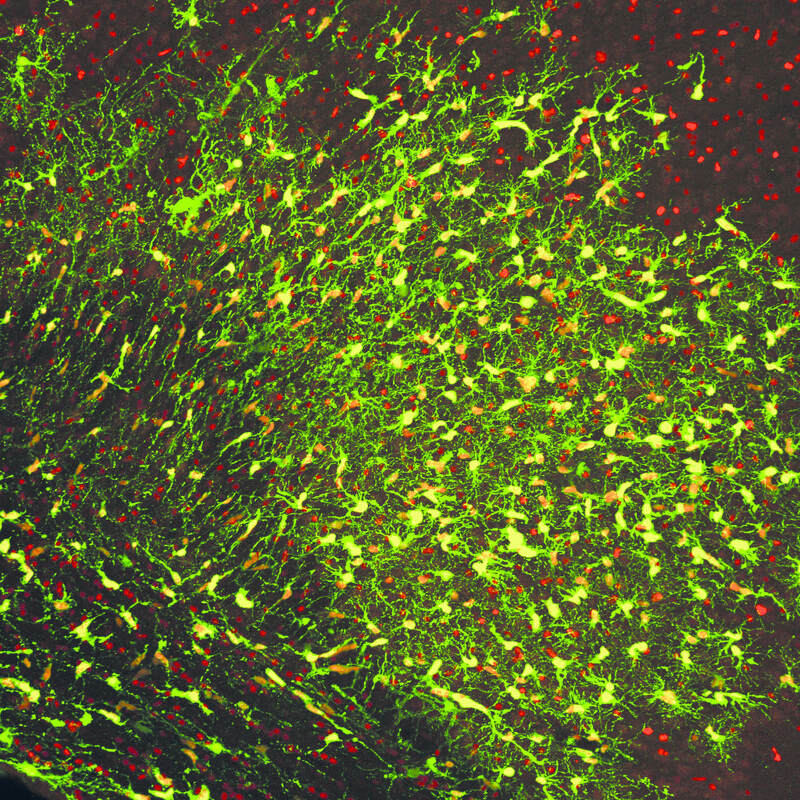 For example, a particular chromatin conformation and gene expression programme is actively maintained in self-renewing neural stem cells or postmitotic differentiated cells, enabling the persistence of their respective phenotypes. On the other hand, for stem cells to undergo lineage specification, fate commitment and differentiation, or for postmitotic cells to respond to changes in their environment, their chromatin conformation and gene expression patterns must change. How chromatin accessibility and bivalent histone post-translational modifications at key developmentally regulated genes are remodelled during neurodevelopment and tumourigenesis. ​How transcriptionally silenced and repetitive elements of the genome remain repressed in genomically unstable tumour cells, and whether tumours are especially sensitive to de-repression of these sequences— representing a potential epigenetic treatment paradigm. 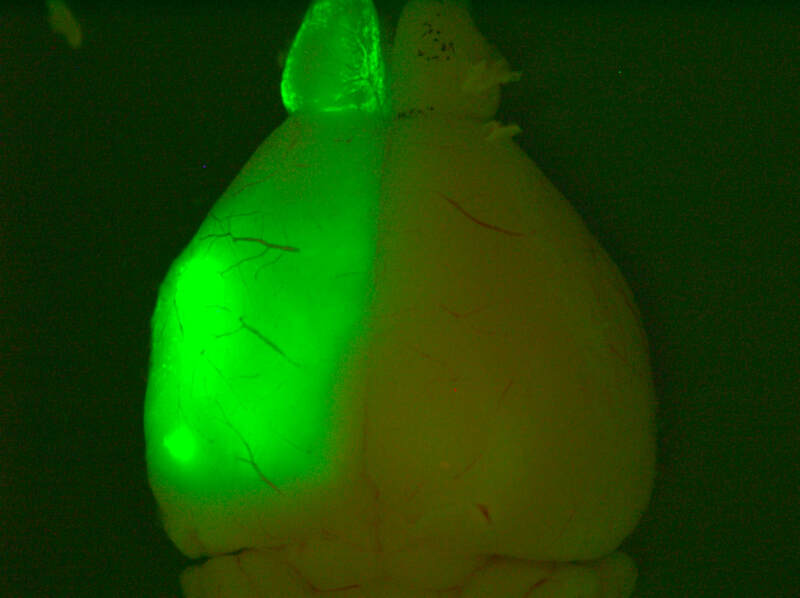 Above: Low magnification view​s of sections of adult mouse brain 4 months following foetal electroporation. 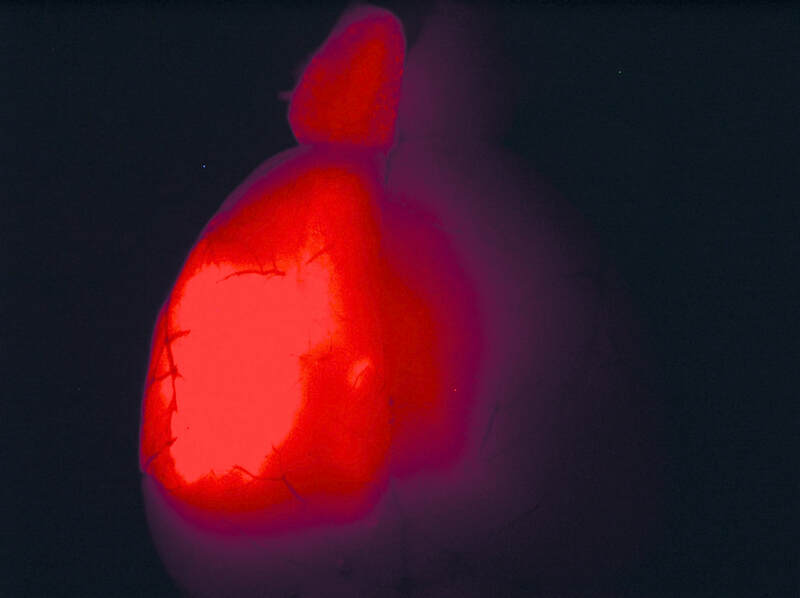 Differing amounts of cellular hyperplasia can be observed, some of which result in complete occlusion of the left lateral ventricle. 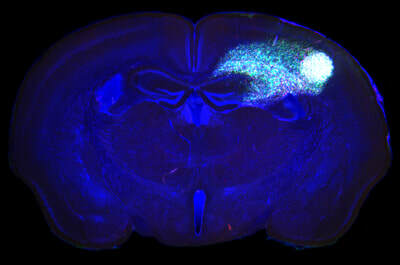 Green: GFP, blue: nuclear stain, red: Ki67, a marker of proliferating cells. Paediatric high-grade gliomas (pHGGs) are a type of incurable malignant brain tumour and a leading cause of cancer-related mortality in children, constituting approximately 25% of all paediatric brain tumour cases in the UK. The primary obstacle in grappling with this disease is a lack of effective treatments, thus incurring a dismal prognosis that has remained unchanged for decades. A related obstacle is inevitable tumour recurrence following the development of resistance. To improve the outlook for pHGGs it is essential to develop more effective therapies and to identify the mechanisms underlying refractory responses to treatment. Recent genomic and epigenomic profiling of large cohorts of tumours has greatly extended our knowledge of HGG molecular diversity and enabled their stratification into distinct, biologically meaningful subgroups. A principle finding from this work has been the widespread and diverse epigenomic deregulation observed in paediatric vs adult HGGs, suggesting that epigenomes are rewired to serve distinct oncogenic programmes in gliomas. However, the molecular consequences of this epigenomic deregulation and its specific contribution to gliomagenic programmes remain poorly characterised. 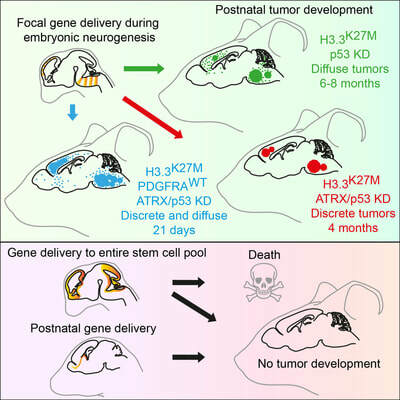 Recently, we developed an in vivo model of mutant histone-driven paediatric high-grade glioma and discovered that these tumours develop specifically from embryonic neural progenitor cells. ​Going forward, we will combine developmental neurobiology, epigenetics, stem cell science and genomics approaches to reveal the role of chromatin remodelling in paediatric high-grade glioma initiation, maintenance and therapy resistance. Above: High magnification confocal immunofluorescence of Ki67- and GFP-double positive tumour cells on the left (red and green, respectively), and Nestin- and H3.3K27M-HA-double positive tumour cells on the right (red and cyan, respectively). 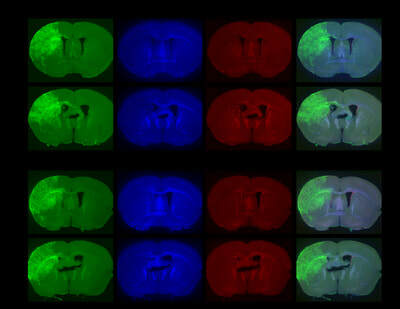 Above: Low magnification views of high-grade tumours expressing GFP and TdTomato in the brains of 4-8 month old animals.